Fossil fuels are finite and eventually their global production will peak and decline. Since our global economic growth has a nearly perfect correlation with global energy consumption, a decline in global fossil fuel energy availability could mean "the end of growth." The argument on the other side is that we will simply become more efficient with our use of energy. The argument goes that we will become less energy-intensive consumers and the energy intensity of our global economy will decline. So are we on the right track? Are we becoming more energy efficient with our global economy? To answer this question, I took data from the World Bank and from BP's Statistical Review of World Energy. 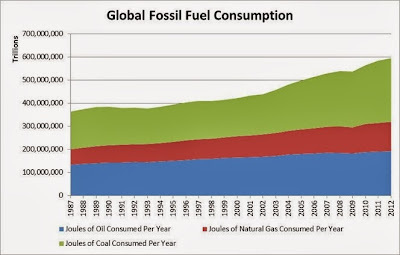 First, we see that on an absolute energy basis (in Joules) our global fossil fuel consumption continues to increase. 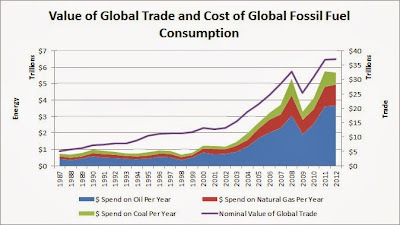 Once we multiply this consumption by the nominal price of each fuel, we can get a global "fuel bill" and compare it to the value of global trade each year. Finally, when we take our global fuel bill and divide it by our value of global trade we get an estimate for how much value of trade we get for each dollar we spend on fossil fuels. Unfortunately, this analysis shows us that the value of global trade we get for each dollar spent on fossil fuels peaked in 1998 and has been declining since. In essence, we are becoming less and less efficient in our use of fossil fuels at a time when we should be getting more and more efficient. This is bad news for cornucopian economists who believe that energy efficiency will save our global economy from peak oil. 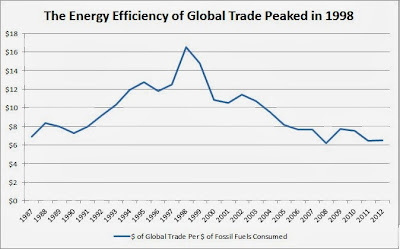 Despite ever-higher oil prices over the last decade, it seems that we have become unable to increase the energy efficiency of global trade. If we can't increase our global trade per barrel in the face of higher oil prices, perhaps this shows that reaching "peak everything" will indeed lead to "the end of growth."